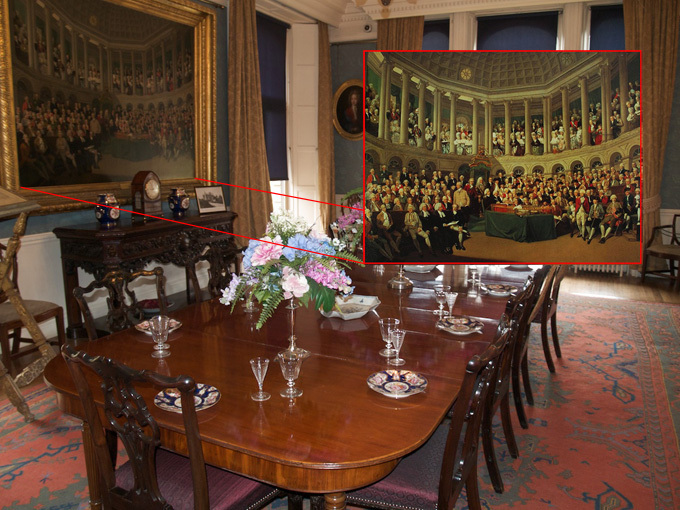 The header photo composition includes a straight view of the Irish House of Commons painting in the Dining Room setting at Lotherton Hall, Nr Aberford, west Yorkshire, where the painting hangs today. The previous home of the painting was Parlington Hall, as was the furniture in the picture. The painting was undertaken by Francis Wheatley in 1780 and at some point was bought, it is believed by Richard Oliver Gascoigne, no references have been found about the purchase, but it is not thought that the painting was acquired by Sir Thomas Gascoigne, the original owner at Parlington who bequethed the hall and estate to Richard Oliver [See the page here about Sir Thomas Gascoigne, and the inheritance. Along with details about Richard Oliver here. ]. The first reference of the painting is contained in the inventory undertaken in 1843 after Richard's death. It was most likely hung in the Dining Room at Parlington, and therefore in its present locale is much as it would have been found at Parlington. The inventory after the death of Colonel Frederick Trench-Gascoigne in 1905 mentions the painting in the Dining Room. The painting features in the Wikipedia entry for Francis Wheatley, but no mention is made of where it currently lives nor its history at Parlington Hall, I will amend the entry to include this article for others to appreciate this great artwork. The painting puts into context the very complex nature of English Irish relations and demonstrates where the Gascoigne point of view was! But although there was a clear link back to Cromwell, the later beneficial works of the two Gascoigne sisters only a few years after the death of their father, in assisting the people on their estates at Castle Oliver (Clonodfoy) at great expense to themselves, shows the subject to be more detailed than much of our history tells.